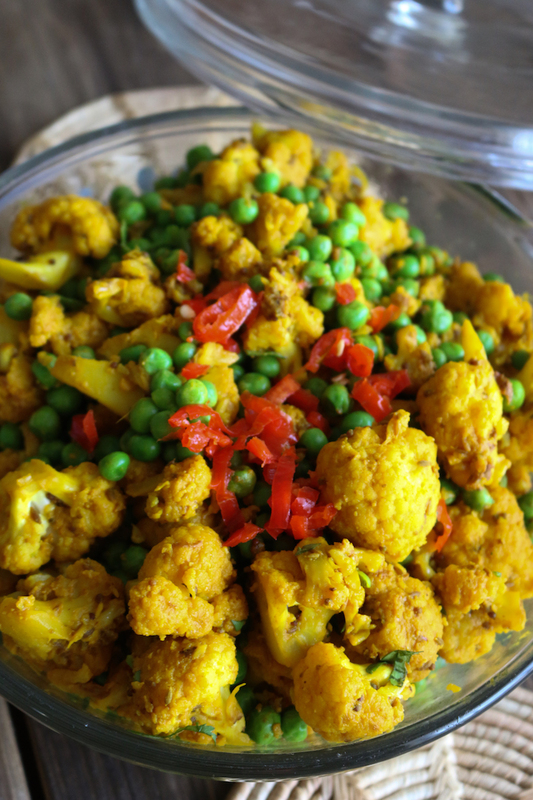 I think by now you all know I love cauliflower; really I love all vegetable but this one is a particular favorite as it’s one of the most versatile vegetables to use in cooking. I use them pretty often, especially in Indian Curries and other Indian style dishes as they have a hearty texture that I like. 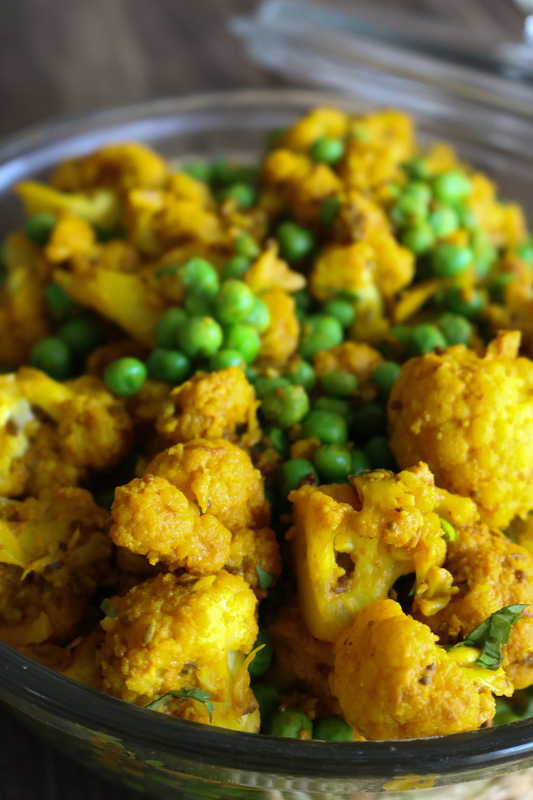 And today I’m sharing a Indian Spiced Cauliflower & Pea recipe, another great one to use for a simple side dish and perfect when pair with your favorite curry and/or rice! 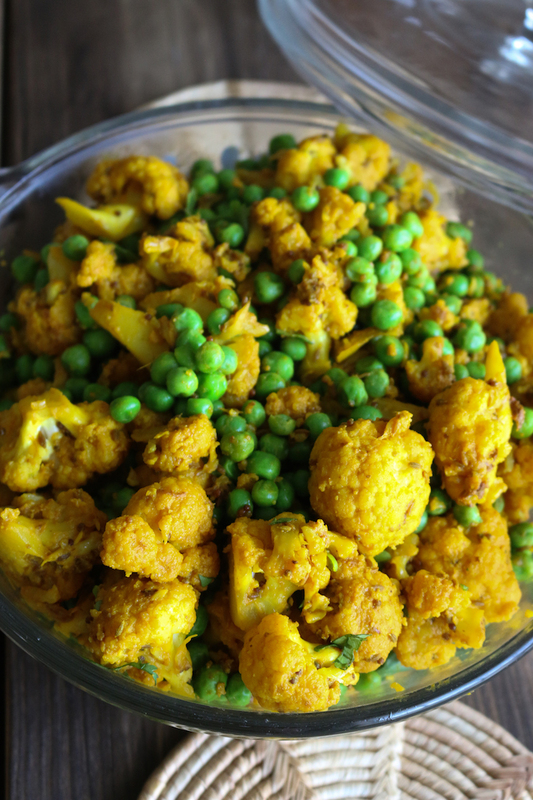 This simple recipe combines many flavors I know you will enjoy like, bold from the curry and turmeric, sweet from the green peas, and a hint of hot and spicy from the Serrano chillies. The final result is a delicious combination of ingredients full of complex flavors, and without the use of any dairy or cream. 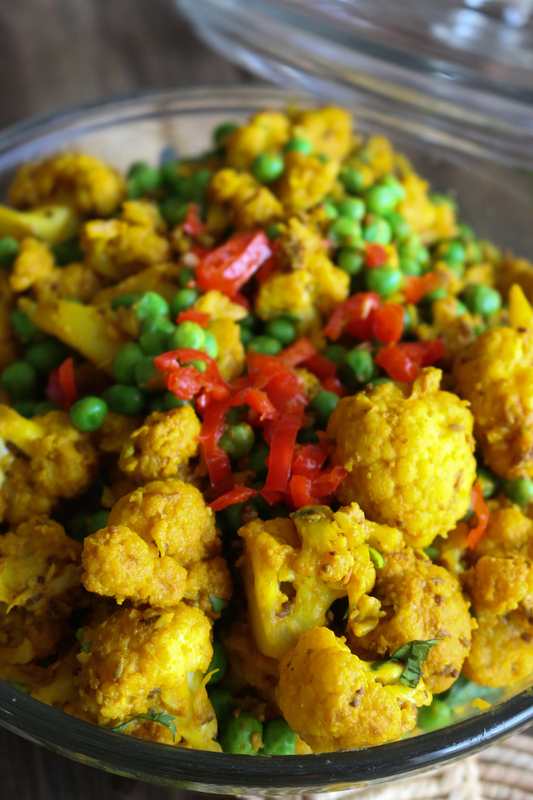 Not only is this tasty, but it’s also loaded with nutrition, mostly in the form of antioxidants from the wonderfully powerful spices and the cauliflower. In a nutshell, this dish contains high amounts of antioxidants and anti-inflammatory compounds. I typically will make a big batch on my meal prep day and store it in an airtight glassware container in the refrigerator for up to a week. And since it’s super easy to combined with anything, it honestly never lasts that long when I make it, it’s just too good! You could easy combine it with green, grains, and/or your favorite Indian dish. I hope you all enjoy this super easy Indian style recipe and use one of my Indian Curry dishes to complete it! 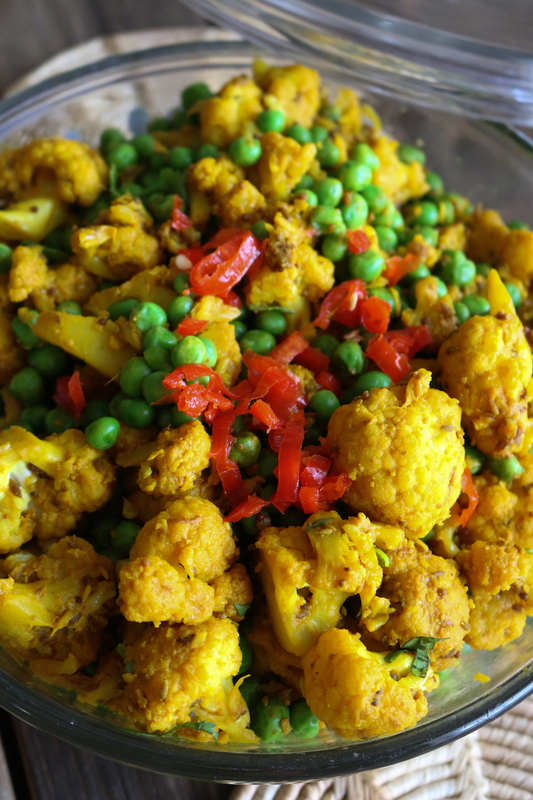 Here are some recipes I have a hunch you’ll enjoy with this Indian Spiced Cauliflower & Pea recipe! Heat a large sauté pan or cast-iron skillet over medium-high heat. Add the coconut oil, and when it is hot, add the cumin, mustard seeds, turmeric. When they begin to sizzle and pop, add the ginger, and garlic. Then add the cauliflower florets. Sauté until the cauliflower begins to color, 3-4 minutes. Season with salt and pepper. Continue stirring until the cauliflower is half-cooked, about 5-7 minutes, lowering the heat if necessary to keep it from browning too quickly. Add the peas, along with a sprinkle of salt. Cover to let the peas steam until tender, 2-4 minutes. Sprinkle with the slivered scallions, Serrano chili, and cilantro. Serve with lime wedges. Enjoy! If you try this recipe, I wanna hear about it! 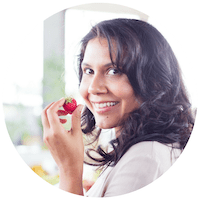 Leave a comment it, rate it and don’t forget to tag a picture with #livesimplynatural to show me how you enjoy these recipes. Stay tune for more plant powered recipes!